S ince it opened in 2013, Rancho Mirage High School, near Palm Springs, California, has never used bells. An audio recording of a rattlesnake, which is the school mascot, can be heard in the hallways at the beginning of the school day, the end of lunch, and when school is over. The rest of the day, students rely on their personal cell phones and watches to keep track of time. 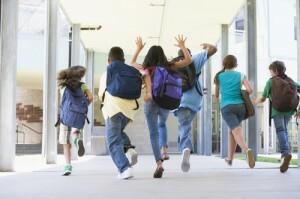 Indeed, getting rid of school bells is a growing trend that has been sweeping American schools. But just because it sounds trendy and new, doesn’t mean it is the right choice for everyone. The Pavlovian response that students have to hearing a traditional school bell is well known by anyone who has ever been to school. You are in the middle of playing a game outside or eating lunch with some friends, and then some obnoxious bell sounds, and the dread sinks in. The fun is over, time to go back to work. Even the end of a lesson is less enjoyable because the sound that students hear is the same as that which begins the lesson. Bells aren’t just tied into an emotional response, they can also create challenges at the end of a lesson. They stop a teacher in the middle of a very important sentence, whether that is announcing the material for next week’s test or answering the question of a curious or confused student. School bells have also been known to stop students mid project, while they are engaged in meaningful collaboration. Once the sound is heard, students lose their motivation, and the thought process is interrupted. No matter what they are in the middle of, whether a sentence, math problem or project, students will jump up immediately at the sound of a bell, because they know the countdown has begun. Soon the break will be over and the next class will begin. Some educators have raised the concern that students will not be able to keep track of time and tardiness will increase. However, schools that have already done away with bells say that this actually lowers the percentage of tardiness, because it encourages students to learn independent time-management skills. At Justin-Siena, a catholic high school near Napa, California tardiness has dropped 30% since they stopped having a bell last year. We should trust students to take responsibility for being on time, because that is what is expected of them in the real world. All high school students have cell phones, which they can use to keep track of time during breaks. Colleges and jobs do not have bells to tell students when class is over, or when it is time to move from one task to the other, and yet most people manage to show up on time. The earlier we teach students to take responsibility for their time, the better equipped they will be for life in the real world. Time management and general responsibility are great skills to develop in high school. By eliminating bells, and thereby helping students learn how to come on time, without relying on anyone else, we are helping prepare them for the future, and life in general. What are your thoughts on eliminating school bells? Should they be eliminated altogether, or just adjusted? What has your experience been with or without bells? Please share your response in the comments below.